Reward yourself with our 2017 Hyundai Elantra SE Sedan presented in luxurious Silver! Motivated by an innovative 2.0 Liter 4 Cylinder that offers 147hp while paired with a 6 Speed Shiftronic Automatic transmission for easy passing control. An ideal balance of power and comfort, our Front Wheel Drive sedan helps you score near 37mpg the highway with the kind of smooth acceleration you dream about! Improved aerodynamics and our signature grille make this sleek Elantra SE practically irresistible. Step into the SE cabin to find generous head and legroom for all passengers; enough to classify our Elantra as midsize rather than compact. Designed with your needs in mind, everything is correctly in place and comfortable. You'll appreciate comfortable front seats, a leather steering wheel, Bluetooth hands-free phone system, a touchscreen display with Android Auto, and other top-shelf amenities. A remarkable blend of capability, comfort, style and value, our 2015 Jeep Compass Sport 4X4 in Maximum Steel Metallic Clearcoat will inspire you to take on that next great adventure! At the heart of our Jeep is a proven 2.4 Liter 4 Cylinder that generates a healthy 172hp paired with a 6 Speed Automatic transmission. This Four Wheel drive rewards you with near 30mpg on the highway, the sure-footed confidence of 4x4, and a composed ride you'll look forward to each day! The classic exterior styling of our Compass Sport turns heads with its distinctive grille, bold lines and attractive alloy wheels. The muscular physique is further enhanced with roof rails and fog-lights. Inside the Sport, you'll appreciate the convenience of air-conditioning, cruise control, 60/40 split-folding rear seats and a sound system with a CD player and auxiliary audio jack. Of course, this Jeep has been carefully designed with anti-lock brakes, stability and traction control, front-seat side airbags and side curtain airbags to keep you and your precious cargo safe from harm. Stylish and smart, your charming Compass Sport is eager to please you! Print this page and call us Now... We Know You Will Enjoy Your Test Drive Towards Ownership! Our 2014 Toyota Corolla LE Sedan shown in dynamic Classic Silver Metallic is eager to please. Powered by a 1.8 Liter 4 Cylinder that offers 132hp while paired with a CVT for incredible passing commands. This ideal Front Wheel Drive combination helps you achieve near 38mpg on the open road and is perfect for your commute. It's no surprise that our Corolla ranks as the best-selling car of all time! Now with a wider, more aggressive stance, the exterior of the LE is a perfect balance of style and efficiency. The attractive metallic accented LE interior boasts plenty of legroom with technology that is straightforward and user-friendly. You'll appreciate keyless entry, heated mirrors, cruise control, and a 60/40-split-folding rear seat. A 6-inch touchscreen display acts as your personal command center, while Bluetooth, iPod connectivity and steering wheel mounted audio controls are also handy. This quiet cushy ride is sure to please! Meet the solid 2012 Ford Escape Limited SUV AWD shown in Black. Powered by a 3.0 Liter V6 offering 240hp paired with a 6 Speed Automatic transmission. This All Wheel Drive offers up to 20mpg. You will never worry about weather conditions again with this SUV on your side. This Escape Limited has a sporty look with a roof rack, privacy glass, chrome highlights and fog lamps. You will feel the modern comforts of the Limited as soon as you sit in the driver's seat that's below the huge sunroof. A 6 speaker audio system with CD player, available Sirius XM and audio input jack lets you rock to your favorite tunes. Heated, leather seats and leather wrapped steering wheel add to the luxurious feel of this Limited. You will love the storage options and lighting and there is plenty of cargo space for your active lifestyle. The Ford Escape is one of the safest SUV's on the market. Six standard airbags, tire pressure monitoring and stability control ensure you and your passengers are safe. MyKey allows controls to be set for the younger drivers in the house to ensure safe driving. You have chosen well with the Escape! It is a fun, smart and versatile SUV for someone who is active and needs a vehicle that can keep up. Print this page and call us Now... We Know You Will Enjoy Your Test Drive Towards Ownership! Add some class and distinction to your daily drive with our 2011 Nissan Juke SL AWD proudly shown in Sapphire Black. Powered by a TurboCharged 1.6 Liter 4 Cylinder that generates 188hp while connected to an innovative CVT for amazing passing. This All Wheel Drive combination offers near 30mpg as well as a host of luxury amenities that you're sure to love! The SL cabin is full of clever details in addition to the sunroof and comfortable heated leather seating. Take a good look at our pictures and see all the power accessories, a full-color navigation system, and amazing audio with CD and Bluetooth capability. We bet you won't be disappointed with your surroundings! Take your seat behind the wheel and you will notice the high seating position makes it feel larger inside. Our Nissan Juke delivers an all-around stellar performance with plenty of safety features on board that includes a backup camera and numerous airbags, but don't take our word for it! Come test drive this one for yourself! Print this page and call us Now... We Know You Will Enjoy Your Test Drive Towards Ownership! Our 2014 Nissan Sentra S shown off in Super Black is ready for you! Powered by a 1.8 Liter 4 Cylinder that generates 130hp while tethered to Nissan's Xtronic CVT. Together, this Front Wheel Drive combination not only make your daily commute more exciting but does so while managing an impressive 39mpg on the open road. To match the spirited performance, the Sentra has an aerodynamic body that features LED-accented headlights as well as LED taillights. The Sentra S interior is well-designed and made of premium materials not commonly found in this class. You'll find yourself spoiled with features like power windows, power door locks, air conditioning and a multi-function trip computer. The roomy cabin has more rear legroom than many of its competitors and space whether you bring friends or all of your gear. Our 2012 Buick Verano with Leather group is displayed in Black Onyx. Powered by a TurboCharged 2.4 Liter 4 Cylinder that offers 180hp connected to an innovative 6 Speed Automatic transmission. This Front Wheel Drive Verano delivers the perfect acceleration in any environment, urban or rural and near 32mpg at the same time! Leather trim adds heated premium leather, wood and alloy cabin trim, a heated steering wheel and 9 Bose premium speakers, including a pair of subwoofers to an awesome list of goodies seen here. The phenomenally quiet cabin, where even a whisper can be heard, features amenities such as a power sunroof, steering-wheel controls, Bluetooth, USB, Intellilink, and much more as seen in our pictures. Safety is paramount with Buick, emphasized by ABS, electronic stability control, OnStar, and numerous airbags. Travel is first-class each time you enter Verano. Move about town in the style and sophistication that only this Verano Leather group can bring to your life. Don't delay... Print this page and call us Now... We Know You Will Enjoy Your Test Drive Towards Ownership! Check out our iconic 2012 Toyota Prius Two Hatchback shown in sparkling Black. Powered by a 1.8 Liter 4 Cylinder combined with a 60kw electric motor to deliver 93hp while tied to a CVT for easy passing. This Front Wheel Drive hatchback offers an amazing 51mpg in the city plus stellar fuel economy, great cabin technology, and a comfortable ride makes this an outstanding green choice. Just try to resist the urge to giggle as you pass by the fuel pump! Our Prius Two has amazing styling on the front end, with unique headlight and taillight designs, and black wheels. Built with your busy lifestyle in mind, our Prius Two offers a multi-information touchscreen display that serves as your command center for the car's technology. Bluetooth phone connectivity and audio streaming offer you convenience and safety by keeping you from being a distracted driver. Introducing our 2011 Hyundai Elantra GLS Sedan offered in an amazing Titanium Gray Metallic exterior finish. Powered by an efficient 1.8 Liter 4 Cylinder that offers 148hp while mated to a fun-driving 6 Speed Automatic transmission with SHIFTRONIC. Together, this Front Wheel Drive combination make the drive entertaining and enjoyable, but they also provides near 40mpg. 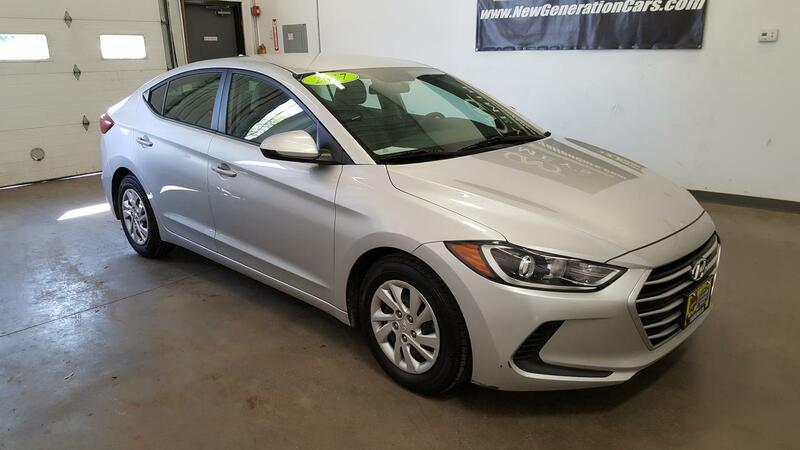 As you approach this Elantra, you will immediately notice the sleek and curvy design. Once inside the GLS interior, you will be impressed with such features as power door locks and windows, cruise control, air conditioning, remote keyless entry, a tilt steering wheel, and comfortable premium cloth seats. Our 6-speaker audio system features a CD player and MP3.